* Select the old canes which had fruit this year and cut them out at soil level. * Choose the two strongest and healthiest new canes on each root to keep in the row. 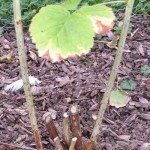 Cut away the weaker canes at soil level & discard..
* Leave only 3 to 4 young raspberry canes per foot of row. 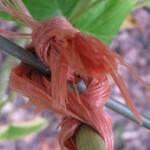 * Tie the new raspberry canes to the supports, using a twisting knot, so that the canes do not rub against the support. * The raspberry canes are quite pliable at this time of the year and can be bent and moved into position. The canes become brittle in the spring and snap easily, so it is important to train them into position now. Pruning the summer raspberry canes as soon as the fruiting season ends, will encourage a good crop of raspberries in the garden next year.